I love it when an opportunity arises when client wants to do something different.This garden design in East Dulwich SE22 London was influenced as is our clients by modern trends and contemporary design both in garden design, interior design and architecture.This East Dulwich garden belonged to a very creative chef, and food stylist who required a place to work with and in that reflected her passion for Eastern, Mediterranean and Moroccan dishes. For this east Dulwich garden design we experimented in creating the right textured and coloured render then distressed the edges to create the required aged, aware that we were not creating a contemporary looking space. The seat has been formed and concrete poured to create this cantilevered effect . The idea was to reduce the visual mass of the seat to let the space breath also bring the strong lines into effect. 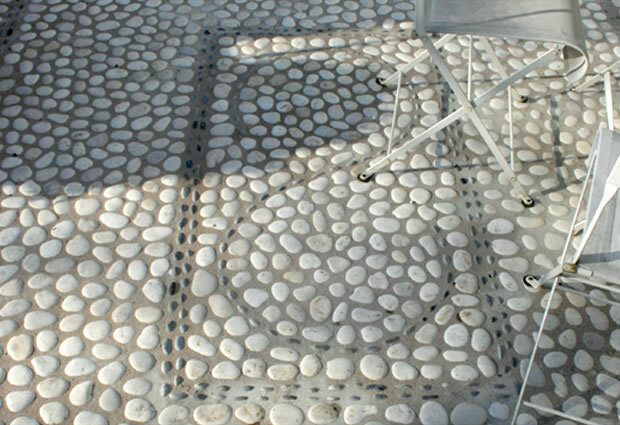 We experimented to create the pebble mosaic design getting correct balance and density using a unique mortar medium capable of holding and bedding in the flat white pebbles. 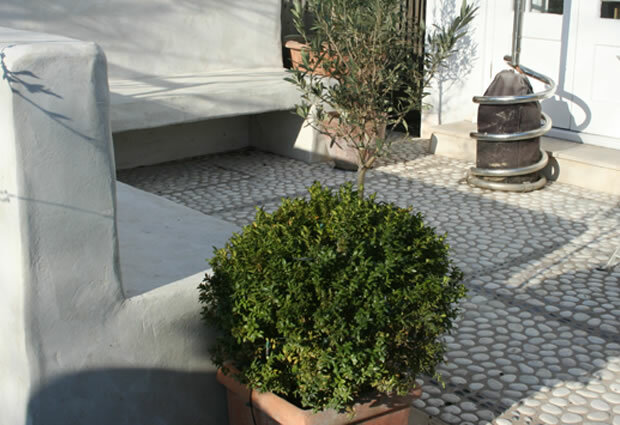 We were looking for essentially a Mediterranean garden with a Moroccan feel, using arts and crafts mosaic pebble designs and distressed colored off white render. The bespoke built barbecue completes this outdoor room with a difference. 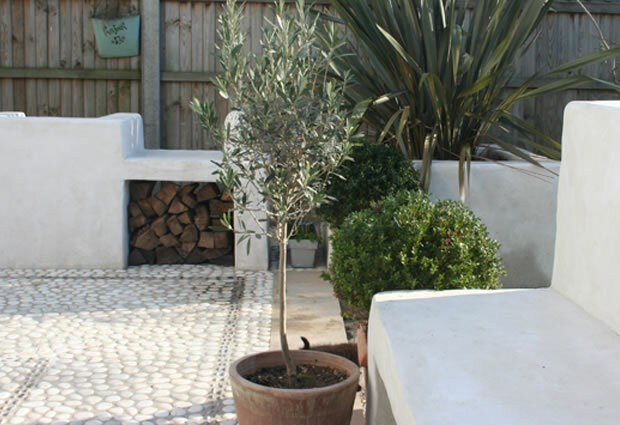 If your are looking for a garden design in East Dulwich SE22 and are in need of a innovative, professional and creative advice for you project . Contact The London Landscaping Company today to arrange a free consultation with one of experienced garden and horticultural designers. Please ask for Billy owner of Company and head of creative . 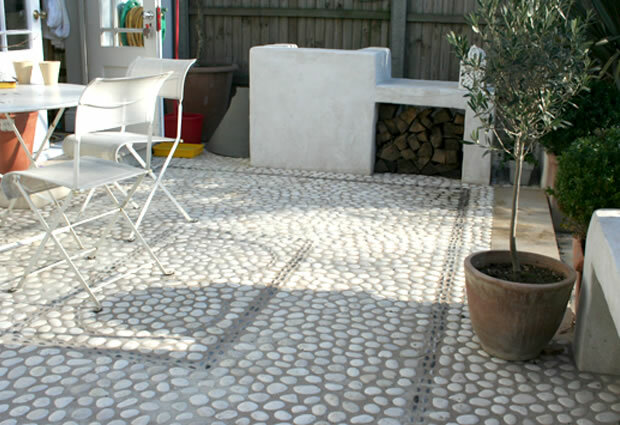 We offer a full range of services from small decks and patios through to full bespoke garden design make overs. We take very project on merit and in its own right both small and large alike. 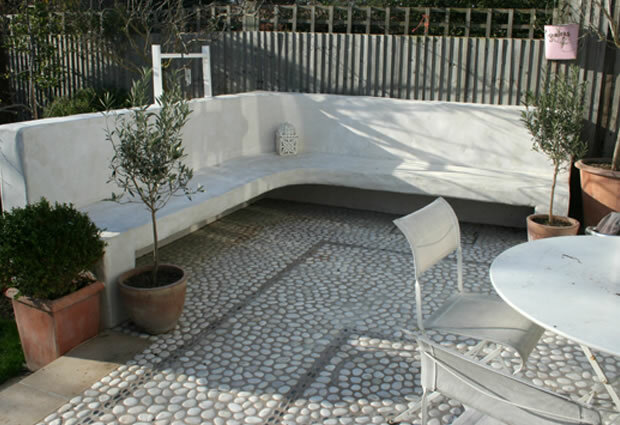 This East Dulwich garden was great a project to be involved with . Our client was passionate and creative and really involved in the process which makes for us a more fulfilling experience .